The 35 Innovators Under 35 lists are published annually by MIT Technology Review to recognize young people whose research is making a lasting impact in their fields. MIT Technology Review in Cambridge collaborated with partner TR China to release the first 35 Innovators Under 35 list specifically for China in 2017. In January, Jing attended a ceremony in Beijing to receive his award. 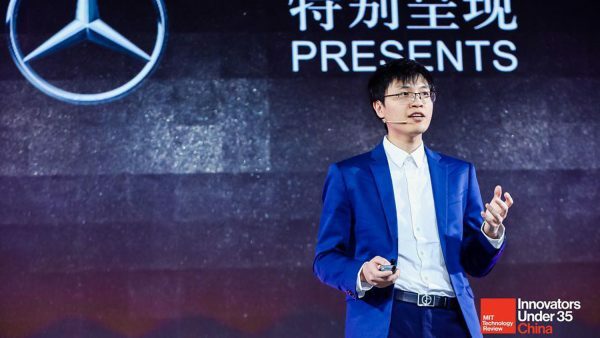 Jing was awarded for his research on acoustics, and specifically for the development of a revolutionary noise control metamaterial that is strong, lightweight, affordable and capable of reducing noise by a factor of 1,000. Metamaterials are manmade structures that exhibit unconventional material properties, such as negative density, not seen in natural materials. In 2015, his lab published a paper on a noise-reducing metamaterial that utilized a layer of membrane inside the core of its honeycomb cell structure. The membrane, which was very thin and lightweight, was highly effective at blocking sound. Jing said he spoke to several companies that were interested in the material — but they asked if the membrane could be removed and if the material could absorb noise instead of reflecting it. That’s when Jing improved the material, removing the membrane and perforating the top panel of the material with very small holes in different sizes. “These very teeny tiny holes actually absorb sound very effectively if you design them properly,” he said. With the addition of the tiny holes, the material almost perfectly absorbs sound from a range of frequencies. The removal of the membrane also made the material five percent less dense and able to more quickly reach mass production. Jing estimates the material will be ready for the market in fewer than five years. Jing said he has talked with many companies in different sectors that are interested in the material, including automobile companies that want to use the material in HVAC systems in cars, companies that make components for airplanes to reduce engine noise and companies that create sound absorbers for architectural acoustics applications, such as for a music studio. Jing started at NC State in 2011 as an assistant professor in MAE after a postdoctoral fellowship at Harvard Medical School, and as of 2013 he is also an adjunct professor in the UNC/NC State Joint Department of Biomedical Engineering. In 2018, Jing received the prestigious R. Bruce Lindsay Award from the Acoustical Society of America as well as the IEEE Ultrasonics Early Career Investigator award. He earned his M.S. and Ph.D. degrees in architectural acoustics from Rensselaer Polytechnic Institute in 2007 and 2009, respectively, and his B.S. degree in electronic science and engineering from Nanjing University in 2006.